(Photos courtesy of Layn Mudder of LPT Images and from Betty from NoDak Speedway) The WISSOTA Late Models returned to the Dacotah Speedway on Friday, June 12th. Fans packed the stands to see the big boys with the big toys fly around the 3/8's mile dirt track. A 10 lap IMCA Sport Compact feature was the first feature of the evening. Joshua Houn started on the pole but the rookie was quickly passed by young Nic West. West led the first lap before over driving turn two and falling to third. Brandon Anderson and Kody Stoxen, who were racing for second, were now racing side by side for the lead. Stoxen would win the battle for the lead as Jason Berg and Josh Roehrich passed West for third and fourth. A caution for debris on lap four would regroup the field and on the restart, Berg and Roehrich slipped by Anderson for second and third. However, a series of back-to-back-to-back cautions cut into their time limit. Race officials made the decision to end the feature early. Kody Stoxen won his second feature of the season over Jason Berg and Josh Roehrich. Brandon Anderson finished fourth ahead of fifth place Nic West. Jeremy Engelhardt grabbed the lead from pole sitter Dylan Thomas in the Hobby Stock feature. Thomas faded through the field early, losing positions to Wyatt Rath-Wald, Josh Roehrich and Nath an Messer. Rath-Wald who started fifth, quickly caught leader Engelhardt and passed him for the lead on lap five. As Rath-Wald pulled away from the field, Engelhardt had his hands full trying to hold off Roehrich and Messer for second. Josh Anderson of Jamestown made it a four car battle for second as Roehrich and Messer passed Engelhardt before a caution on lap eight. On the restart, Roehrich, Messer and Engelhardt continued to race hard for second. While racing three wide, Messer and Engelhardt made contact. Messer's car spun in turn two and collected a few other drivers, leaving the point leader's car severely damaged with five laps to go. While Rath-Wald pulled away once again on the restart, Roehrich was door to door with Keith McCleary for second as Jaren Wald tried to hold off Josh Anderson for fourth. 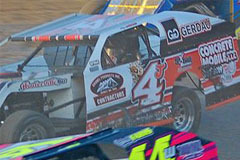 Rath-Wald went on to win his third feature of the season. Josh Roehrich narrowly edged Keith McCleary at the Open Road Honda finish line for second while Jaren Wald held off Josh Anderson for fourth. John Feist and Shawn Becker led the field to the green flag in the WISSOTA Street Stock feature. Becker took the lead while Feist and Scott Gartner raced for side by side for second. Gartner completed the pass for second and quickly caught and passed Becker for the lead on lap four. As Gartner pulled away, Becker, Feist and David Falkenstein raced bumper to bumper for second. This allowed fourth place Jeremy Schmidt to catch the small pack. While challenging Falkenstein for fourth, Schmidt over drove turns one and two and fell back into the clutches of sixth place Zach Frederick. Schmidt held off Frederick as Frederick was trying to hold off Chris Michaelson. A caution erased Gartner's three second lead and set up a six lap shootout for the win. Falkenstein dove low under Feist and Becker on the restart and they raced three wide for second. When Gartner got loose in turn two, it was a four car battle for the win. Gartner's high line around the track prevailed and he picked up his second feature victory of the season. 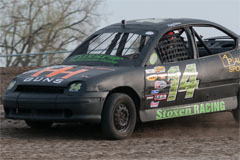 Shawn Becker finished a personal best at the Dacotah Speedway with a second place finish. 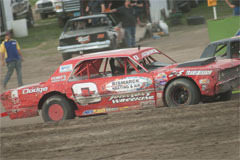 John Feist finished third as Jeremy Schmidt held off Chris Michaelson, who started 19th, for fourth place. Minot's Wayne Johnson started on the pole for the IMCA Modified feature. Johnson distanced himself from the field early as Herb Bargmann and Bradly Steffes battled for second. Jason Wolla, who started 12th, quickly made his way through the field, passing Jerad Thelen for fourth. Wolla, the fastest car on the track at the time, ran down Bargmann and Steffes and as they continued to race hard for second, Wolla passed them both in turn two. As Wolla started cutting into Johnson's large lead, Thelen passed Steffes and Bargmann to take the third position. Steffes and Bargmann quickly faded as they lost positions to Jeremy Keller, Shawn Strand and Mark Dahl. With ten laps to go, Wolla caught the leader Johnson but a caution with six laps to go would but him on his rear bumper. Dahl passed Keller on the restart as Marlyn Seidler passed Strand for fifth. As Johnson was starting to pull away from Wolla, back -to-back cautions set up a green-white-checkered finish. On the final restart of the night, Thelen had his hands full trying to hold off Mark Dahl. As Dahl looked low under Thelen, Seidler looked under Dahl. As they crossed the finish line, Thelen held off Dahl and Seidler to finish third while Wayne Johnson led all 25 laps from the pole to win over Jason Wolla. Johnson rushed from victory lane to his WISSOTA Late Model to start along side Robert Hellebust in the WISSOTA Late Model feature. Johnson picked up where he left off in the IMCA Modified feature as he grabbed the lead from pole sitter Hellebust. However, despite a very smooth race track, cautions came early and often. The first of eight cautions came out on lap two and on the restart, Hellebust dove low under Johnson in turn one and grabbed the lead. Even with all the cautions, restarts didn't hurt Hellebust as he was able to pull away each time. On the eighth and final restart of the night, Hellebust pulled away once again with ten laps to go. Allen Kent passed veteran racer Darrell Bauer for fourth on the restart. Bauer started to fade into the clutches of sixth place Chris Dunn. Dunn was all over Bauer's rear bumper. However, as the laps wound down, Bauer held off Dunn to finish fifth. 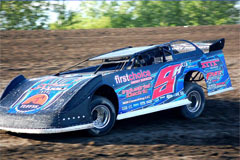 Minot's Allen Kent finished fourth behind Tyson Turnbull and Wayne Johnson as Robert Hellebust won his first WISSOTA Late Model victory at the Dacotah Speedway. The last race in June ends with something fun for the kids! Friday, June 19th is Kids Day at Dacotah Speedway, brought to you by Fun On The Run and Armor Interactive. And just for the kids, Fun On The Run will have inflatables for the kids to play on before and during the races. 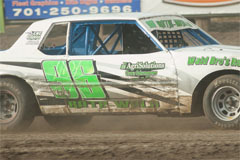 All classes will be competing for local Mandan Dirt Series and National points.